Another "top Nutrition blog" win! 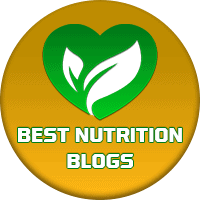 "Top 21 Nutrition Blogs You Should Know About"
I have previously been listed on "Top 100 Nutrition Blogs" (2016), " 100 Leading Sites for Holistic Nutrition Consulting & Therapy" (2014), and " Best 150 Health and Nutrition Blogs" (2017). Thank you to all my readers! You are the reason I do this.